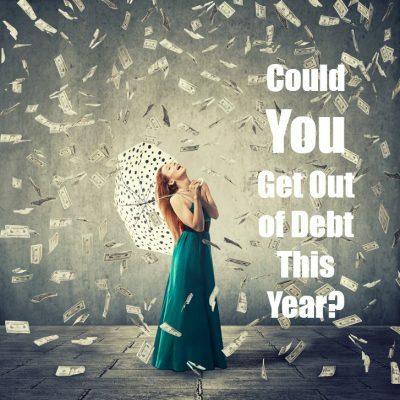 Could You Get Out of Debt This Year? This drives me absolutely nuts!! C-mon, people! You’ve got a debt hanging out there that’s HUGE and is costing you thousands of dollars a year! Stop ignoring it! That ostrich “head-in-the-sand” approach that you’ve grown fond of…it isn’t working! That lion can still see you and you WILL get eaten if you don’t start moving and figuring out this debt thing! So what’s the answer? What’s going to spring you into action? Want to know if you can get out of debt this year? First, you’ve got to know where you stand. How much debt do you really have? Stop reading for a second, go grab a pen and paper, and start writing it all down. Seriously, right now. Don’t convince yourself that you’ll pull this article up later and do it then. It’s not going to happen. Do it now! Student loan debt = ? Credit card debt = ? So what’s your total? Big or small, it doesn’t matter. What matters here is that you’ve established the finish line – you know the end goal. So congrats! Now we’ve just got to figure out how to get there! 2) How Much Can You Spare Each Month? In a typical month (you know, those months where you’re not chronically perusing Gucci handbags or dipping your toes in the sand of some Caribbean island), how much excess cash do you have after paying all your bills and feeding yourself? $100? $200? What if you got really serious about this ‘get-out-of-debt’ thing and started paying attention to your money? What if you actually wrote down what you spend each month? Maybe you should finally start to question some of those bills that are on auto-pay (cell phone, dollar shave club, subscriptions…)? And, what if you actually started to get rid of things you didn’t need and negotiated some bills down that were just getting way too big? You know what? Instead of $100 extra a month, I bet you could quickly find a way to have an excess amount of $500 or more – all without really breaking a sweat. It just takes a little thing called, “Intentionality”. Figure out where all your other money is going each month. It’s not hard…it’ll only take you a few minutes. BUT, let me guarantee you, it WILL be an eye opener and it WILL propel you toward financial success. 3) How Much Extra Can You Make? So after figuring out your spending to see how much you could save, if you really want to make it a goal to get out of debt this year, then you’ll probably want to figure out how much extra money you could make as well! Do you have a hobby that could make money? Are you skilled in something that people would pay you to do? Or, do you have a buddy that’s always looking for extra help in his business? You’ll want to keep your day job, but that only takes up 8-9 hours of your 24 hour day! What if you worked another 2-3 hours a day at something that earned you $20 an hour? That could earn you an extra $1,600 a month! I bet that amount of money could help you get out of debt this year!! Want a list of ideas that will help you make more money? Here’s more than 50 of them!! You may not have realized it yet, but you just did all the things necessary to figure out if you could get out of debt this year. And now it’s time for the moment of truth. It’s time to put all these things together into the free debt snowball calculator. Want to know if you can get out of debt this year? This tracker will show you. Will you be able to get out of debt this year? Heck, maybe you could get out of debt in less than a year! There’s only one way to find out! Download the free debt snowball calculator, put in your numbers, and see when all those debt will pay off! Want some more direction on how to use the tool? Check out the original post here. The post Could You Get Out of Debt This Year?? (w/ Free Debt Snowball Calculator) appeared first on Life And My Finances.